Take a look at our guide to all the Mellieha Bay hotels and more of them here. They are all grouped together for fast reference and to help you make the right choice for your budgeted target. 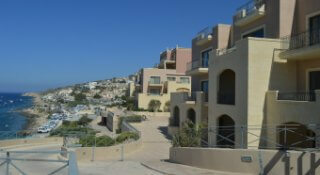 Best Mellieha Malta accommodation is not only hotels but various villas and apartments which are not hard to find. We provide links to see the variety of available accommodation even if you have a budget in mind. Do have a look to find the right one for you. The accommodations in Mellieha are in ideal quiet locations on high ground with open air landscapes and not least with sea views or at sea leave just in front of the beach. Anywhere you choose Mellieha is a small village and you are never away from the centre and the beaches. Read reviews, compare rate – and then choose the one that’s perfect for you! The Panorama Hotel has 60 rooms located at the edge of the village cliffs with unobstructed views of the sandy bay where the views extend far out to Comino island. It is 400 metres from the city centre. The only pool is at roof level is an an attraction of its own due to the views and relaxing atmosphere and quiet location. Both breakfast and lunch are offered in the main restaurant in buffet enjoying open views. The al fresco a la carte restaurant is open only in summer. Tas-Sellum residence is a high standard residential complex located close to the seashore area down from the village. The apartments are well decorated and furnished. The use of an outdoor communal pool and sun deck, free parking and facilities for disabled are available. Bella Vista offers two apartments located 5 minutes' drive from the sandy beaches with free parking. The pool is nicely decorated with a terrace beside it all at room level enjoying beautiful views and privacy. Use of shared washing machine in the common area. A partner swimming pool 15 minutes by walk from the apartments. 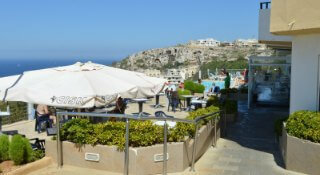 The Pergola Hotel is well located in a quiet area up on a hill with lovely fantastic views and beautiful surroundings. It is, a short walk away from the fabulous church and close to the village centre with numerous different shops for your needs. It is the location for those who wish to avoid street noise and few people around. Offering two indoor and one outside pool, a sauna, gym, bar in natural rock formation, and restaurants. Rooms are cosy with everything you might need. Located close to the many shops and eating places. The bus stop for easy access to other parts of the island. The apartments overlooks the sandy beach and is 10 minutes walk from the village parish church while the beach is two kilometres away. The nearest bus stop is 250 metres away. The commercial centre area is just a few minutes wals araw. They are equipped with a full kitchen, warm internal decor, free Wi Fi and a washing machine.